A colourful geometric wallhanging with added texture, guaranteed to brighten up any room. Get started on this fabulous fringed wallhanging by Victoria Haynes with our 100th issue. Not a subscriber? Find this crochet pattern project in issue 100 of Inside Crochet, available to order online or download directly to your smart device. Add to the stash: Buy this pure cotton yarn from www.woolwarehouse.co.uk or enter our competition for your chance to win all the yarn needed for this pattern project. 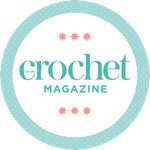 Designer biography: Victoria has been crocheting for almost ten years, and can usually be found curled on the sofa, hook in hand with a huge mug of tea by her side.